SkinCeuticals - A.G.E. 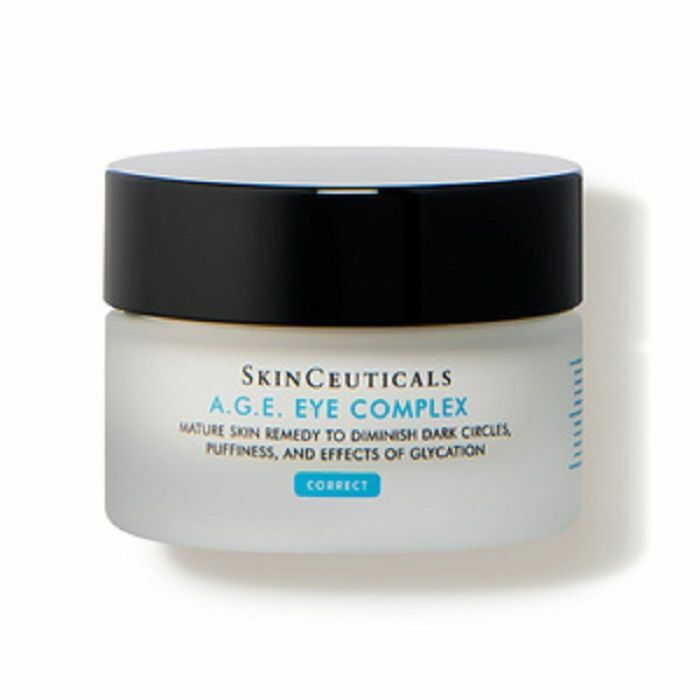 EYE COMPLEX is a three-dimensional treatment containing a unique combination of ingredients to dramatically improve severe signs of intrinsic aging around the eyes. Immediately, optical diffusers improve radiance and minimize the appearance of dark circles and capillaries. Within four to twelve weeks, a synergistic complex of flavonoids and peptides further improves the appearance of dark circles and puffiness. Water, Glycerin, Dimethicone, Isohexadecane, Paraffin, Silca, Polyglyceryl-4 Isosterate, Prophylene Glycol, Cetyl PEG/PPG-10/1 Dimethicone, Hexy Laurate, Nylon-12, Hydroxyprophl Terahydropyrantriol, Methysilanol/Silcate Crosspolymer, Polyethylene, Ascorbyl Glucoside, Caprylic/Capric Triglyceride, Octyldodecanol, Tocopherylacetate, Vaccinium Myrtillus Extract/Vaccinium Myrtillus Fruit Extract, Sodium Citrate, Phenoxyethanol, Steric Acid, Caffeine, PEG-6 Isosterate, Ethylparaben, N-Hydroxysuccinmde, Triethanolamine, Chlorphensin, Palmitoyl Terapepide-7, Palmitoyl Oligopeptide, Ammonium Polyacryldimethltayramide/Ammonium Polyacryloydimethyl Taurate Menthoxypropanediol, Pentasodium Penteiate, Dipeptide-2, Chrysin, Hesperidin Methyl Chalcone, Hesperetin Laurate, Methylparaben, Titanium Dioxide, Aluminium Hydroxide, D36482/2.